Day 11 | Republic-Colville | captain-nicholls | Le Tour de U.S.
We decided last night to leave early and we did but as we left the motel the weather was less than desirable. We hung out at Subway until 8:30 and just decided to go for it. It was quite cool and we were back and forth on whether or not to wear rain gear or not. Jim was the only one not to put anything extra on. We did run into a bit of rain but not enough to put anything extra on. We ran into Kirsten and Etienne (the dutch couple) again at the summit. My stomach was off again this morning and breakfast was hard to get down. Trevor's chain broke just out of Kettle Falls and I used my chain tool to put it back together. Pulled into Colville and found the motel. They put us into two rooms for the same price as one room. Trevor took his bike down to to the bike store and they took out one link so he's good to go. The store carried guns, camping gear, cross bows, flotation devices, and pretty much everything else even remotely related to sport, not many bikes but friendly helpful staff. 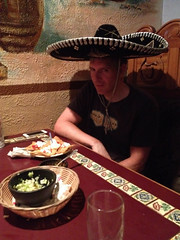 It's Francois' birthday today so we took him out to dinner at the Mexican restaurant. 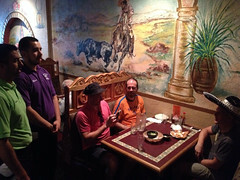 Good food, great staff and Francois wore the birthday sombrero while they sang happy birthday to him. After supper we went to Safeway and picked up a few things. We ran into Kirsten and Etienne again. Brief chat and they said they were taking a rest day tomorrow so we won't bump into them again. Back to the Motel and got ready for tomorrow. I went down to Zips Restaurant to see what time they open tomorrow. We are leaving early. Francois' birthday at Mexican joint in Colville.